Oh hey I almost forgot I have a blog! Apparently last time I posted Charlie was just starting to pull up.....well we now have a walking, talking toddler who keeps me quite busy. He is currently very into balls, dogs, throwing things down and saying uh oh, climbing, running, not napping, and teething. Life is exciting! 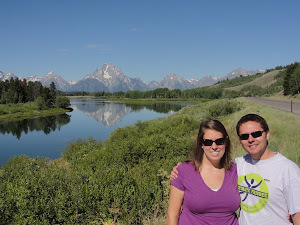 I'm making my re-debut into the blogging world to show you pictures from our trip last weekend to Yellowstone. This was our first "vacation" as a family of three (that didn't involve going to visit family) and we had a blast. We drove from Pinedale to Jackson, up over the Teton Pass into Idaho, and then into Montana...all in 3.5 hours. The drive was quite beautiful and I always love driving around here on roads we haven't driven before! We stayed at the Moose Creek Inn in West Yellowstone in the Moose Suite (how fancy!) Don't know why I didnt think to take any pictures of the place but I didn't, sorry! It was really nice though! Throughout the next three days we explored and hiked through the park. Our little guy was such a champion seeing as how he was either buckled into his car seat or in the hiking backpack for most of the trip. We were definitely thankful for his compliance. Well, semi-compliance...by the last day it took both Mickey and I to get him strapped into his car seat. That boy is strong!!!! But sadly it was just a buffalo in the road. One of the natural hot springs. My cool action shot. The water on the left is boiling water coming out of the ground! Another shot of some of the geyser pools. A hooded Charlie in the camping pack. Forest fire? Nah just smoke off the geothermal stuff. One of the many beautiful waterfalls. Huge waterfall in the Grand Canyon of Yellowstone. See the little marmot? We saw him on one of our hikes. Marmot playing with his buddy. Back in this thing again? Fresh bear track we saw on a hike. Family pic with the buffalo. We had a great trip and were so thankful to get to see Yellowstone while we live up here. The whole park was gorgeous and it felt like each area looked so different. Hopefully I will be back before another 10 months passes! Here's a few more pictures just cause I am obsessed with taking pictures of this kid! Remember just a few days ago when Charlie was learning to crawl? Well, I'd say he pretty much knows how to now! He's not totally great at it yet, but he can definitely go when he wants to. This little boy is growing up! Charlie is trying SO HARD to crawl. He hasn't mastered it yet but I am wishing he would soon because every time I put him on the floor he gets into the crawling position and then gets upset that he can't do it. Thought I would share this very cute video of Mickey showing Charlie how it's done. Half a year old already! Time really does fly by. I look at my sweet little boy growing up and changing every day and I just want time to slow down. It wasn't that long ago that he was just this little blob of newness. Charlie is so much fun and brings so much joy into our lives! He loves smiling and laughing and is really enjoying his new trick, sitting up! In the spirit of the olympics he has also been working out. And rolling himself into a baby burrito. He absolutely LOVES to eat and has yet to try a food he doesn't like. He is now eating solid food 3 times a day. Have you noticed that the mohawk is gone?! I think his hair finally got long enough to sit flat. Charlie is about 5 and a half months now and boy is he fun!! He is getting more and more of a little personality every day and I love getting to watch him soak up everything around him. Also, he is really cute. We are having so much fun with this little guy. He especially loves it when we are both playing with him at the same time. He just looks back and forth between us over and over. Our little mountain baby at Sacred Rim. He LOVES being on Mickey's back while we hike. We have a roller! Charlie has started rolling in the last few weeks. At first we called him a phantom roller because I would put him on his stomach to sleep and when he would wake up from his nap he would be in his back. I never saw it so I didn't really count it as a real roll :) He has gotten pretty good at it now! As you see in the video, he can do it in no time at all! Side note--I am glad he is rolling over and getting bigger (13 pounds, 11 ounces at his last check up) BUT it's not that great that he only likes to sleep on his stomach yet rolls to his back sometimes in bed. Then he wakes up and protests loudly that he can't fall back asleep. He sure is keeping me on my toes! Hopefully he learns to roll himself from his back to tummy soon!